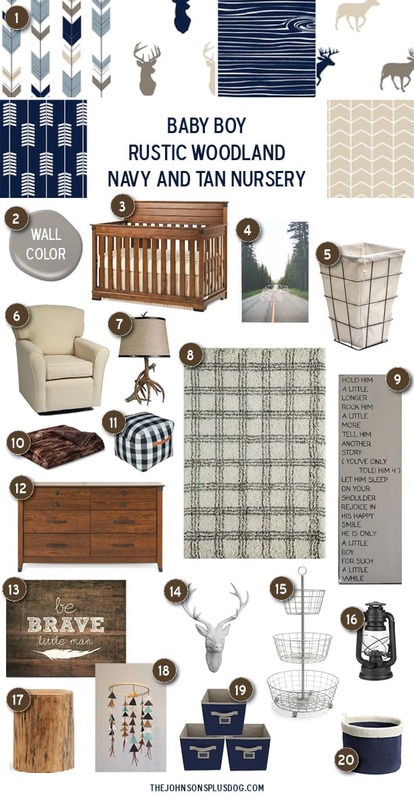 Rustic Woodland Nursery for Baby Boy - Love This Rustic Boy Nursery! Calling all mamas-to-be!! 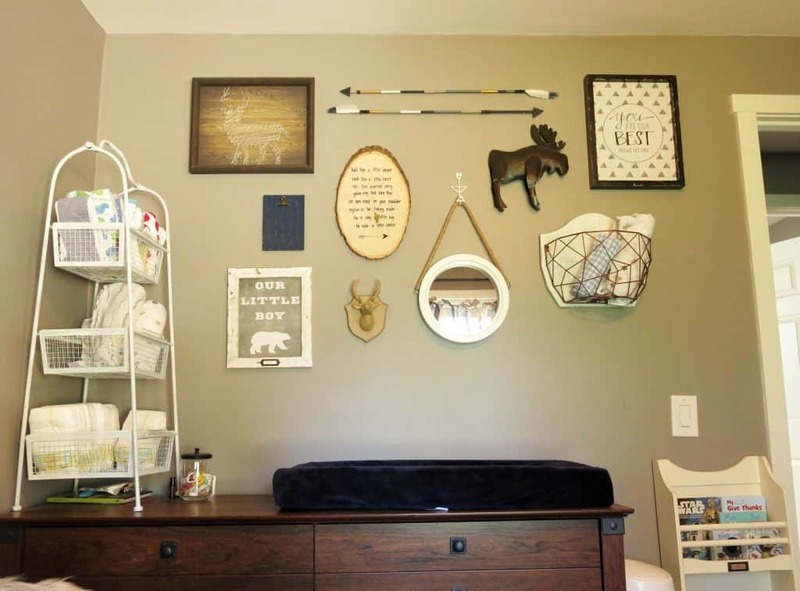 This woodland nursery is just what you need for your baby boy. 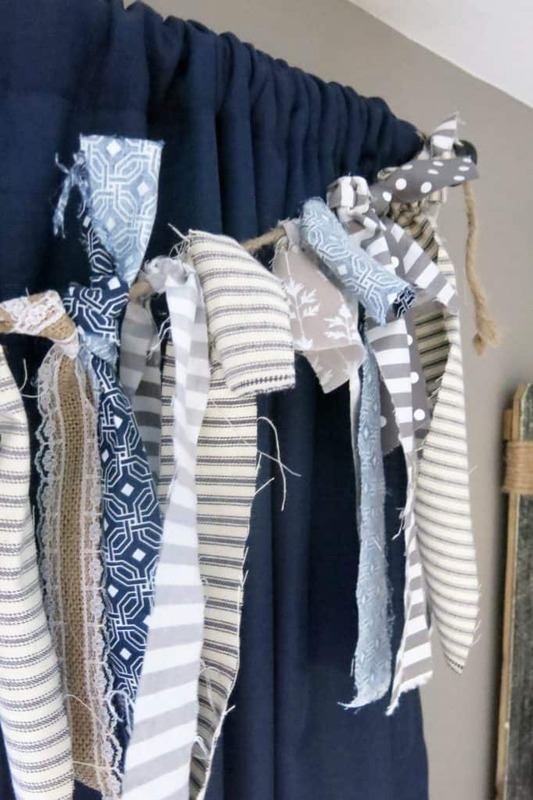 Check out this adorable rustic nursery room reveal with a navy blue, tan and gray color scheme! 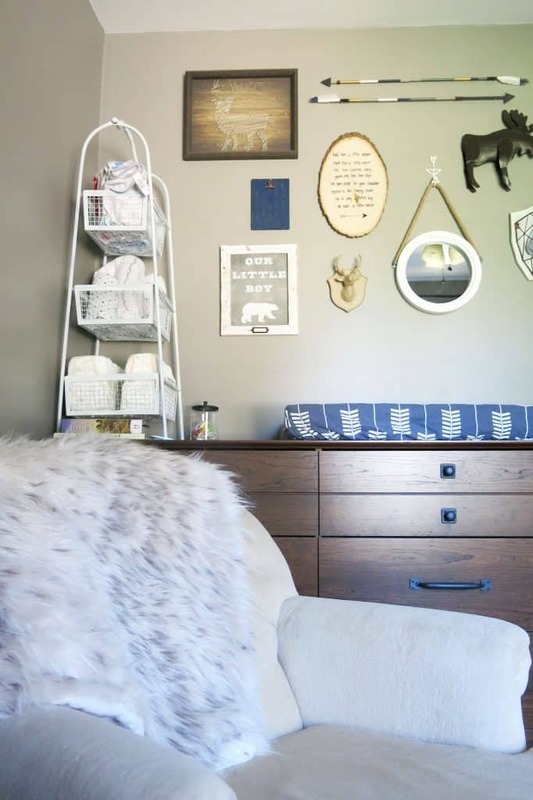 You’ll fall in love with this rustic boy nursery. The day is finally here that I get to share Cal’s Baby Boy Rustic Woodland Nursery with you! These are one of these days that totally make your heart smile. I’ve been bursting at the seams / super nervous waiting to share rustic boy nursery with you. This woodland nursery post contains affiliate links, but nothing that I wouldn’t wholeheartedly recommend anyway! Read my full disclosure here. 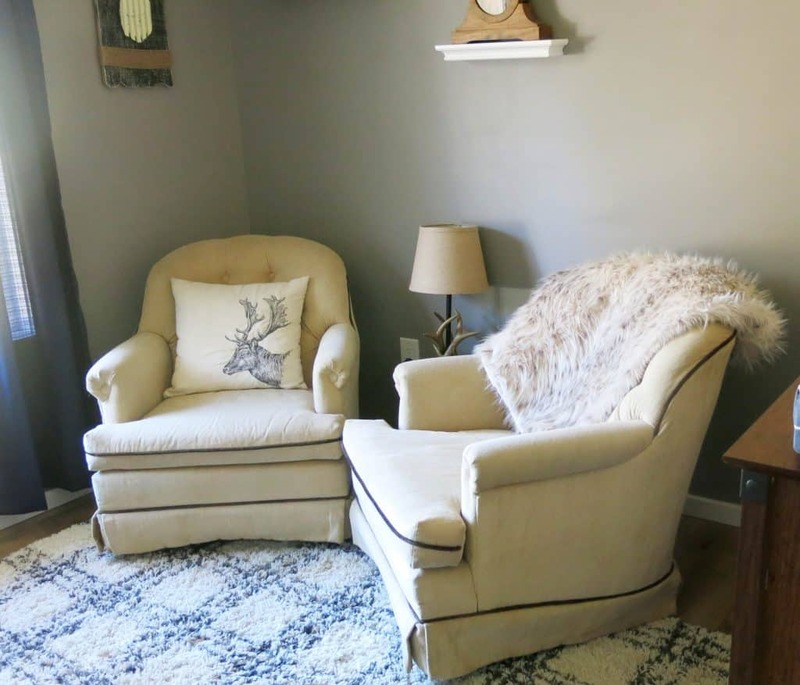 You guys have seriously been encouraging me to get this woodland nursery room reveal posted because I keep getting emails and comments on the inspiration post asking how our rustic boy nursery turned out. Well, I don’t have much of an excuse besides that I’m a typical DIY blogger over here/perfectionist and I’m just never quite satisfied…you know, there’s always ONE more project I want to finish. 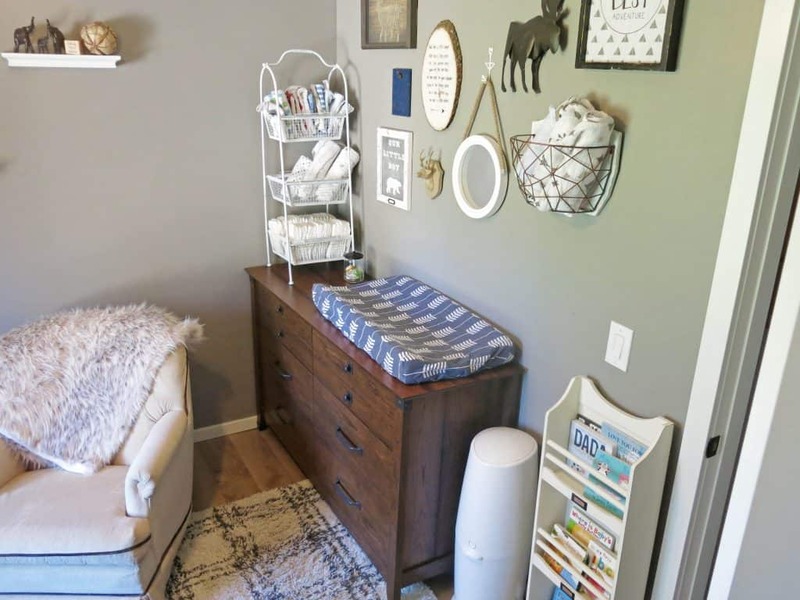 However, I don’t think his woodland nursery will ever be “complete” as I slowly want to take on more and more fun projects and mature the room as he continues to grow. Speaking of growing…. he is almost FIVE months old. Seriously, where is my little baby going? I snapped this picture on my phone a few nights ago. 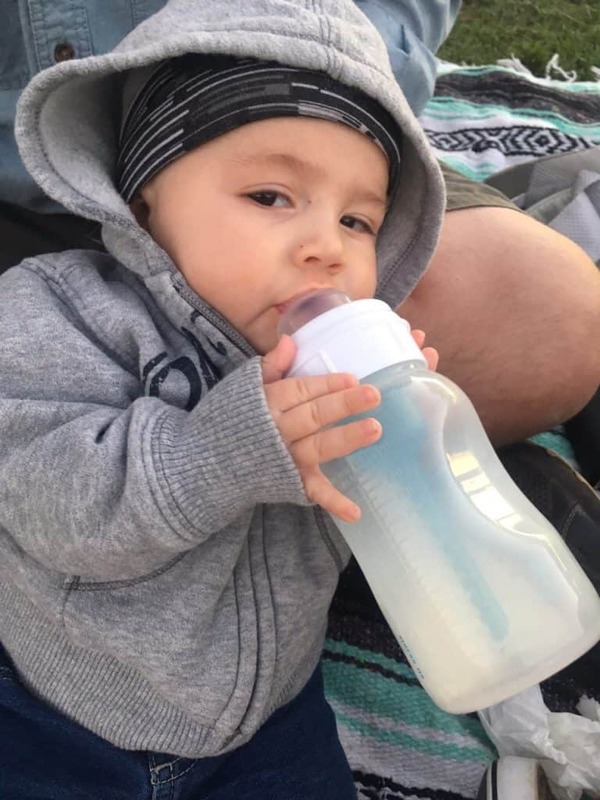 He now insists on trying to hold his own bottle. I just love how our little baby boy rustic woodland nursery turned out. This room has seriously serves us WELL since we moved in. We kept it fairly empty because we knew we were going to try to have a baby soon and didn’t want to get a room set all up just have to tear it down and figure out what to do with all the stuff. While we were putting laminate wood flooring down in master bedroom & living room, we slept in this room with a mattress on the floor. That was realllllly fun 6 months pregnant and all. Then while we were finishing up the living room, we had our TV, and two recliners in this room and used it as a VERY small living space. I’ll never forget our first Christmas in this house. We had a little 3-foot fake tree on a nightstand in the corner. I did what I could to decorate that room because the rest of the house was torn apart. I’m so glad we were finally able to get everything else outta here and get to work on creating a woodland nursery for our little guy. 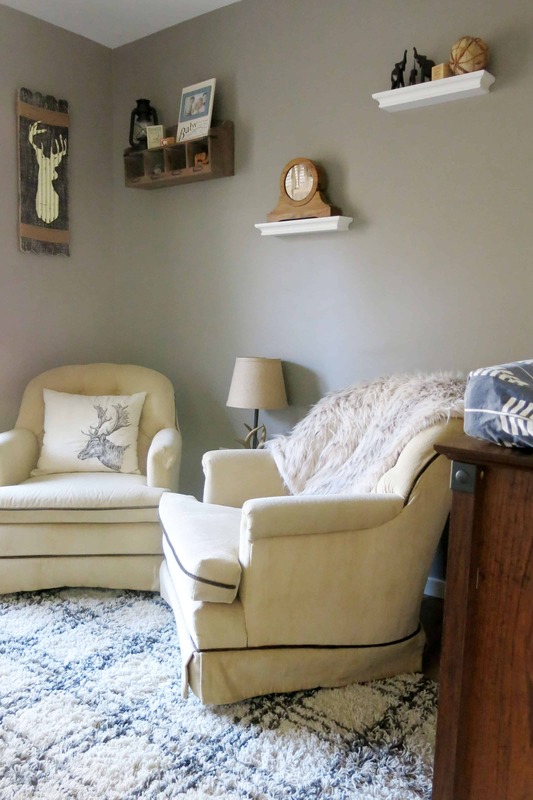 One of my favorite things about our rustic boy nursery is the furniture we ended up with. I love how rustic they look. 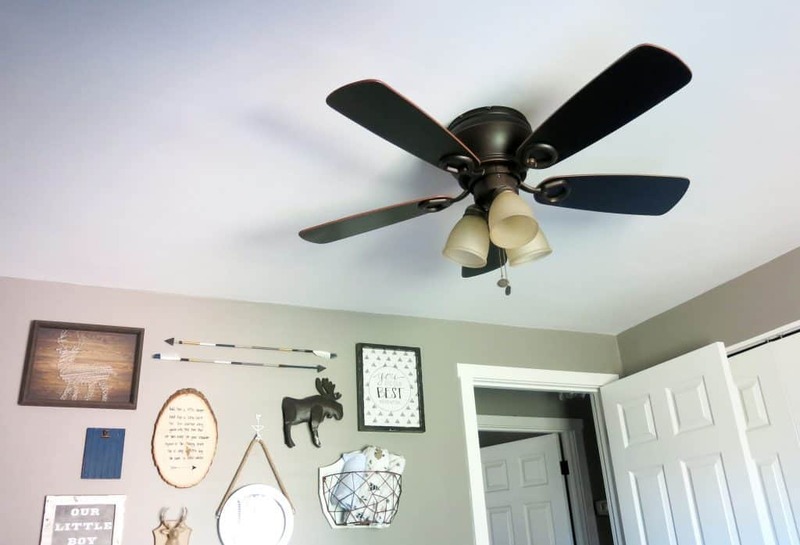 It really ties the room together. Typically I’m a thrift store furniture kinda girl, but with all the other house projects we were trying to tackle I knew we needed something more simple. I also liked the idea of having something clean, sturdy and new for our little man. We decided on the Child Craft Redmond set. Although they make a changing table in the set, we ended just getting the dresser and putting a changing pad on top for our rustic nursery. We are very happy with the dresser and crib so far! We also got the matching desk, which I’m using in my office right now. I needed a new desk and we figured that someday the dresser and desk may end up in the same room so we might as well get them to match! 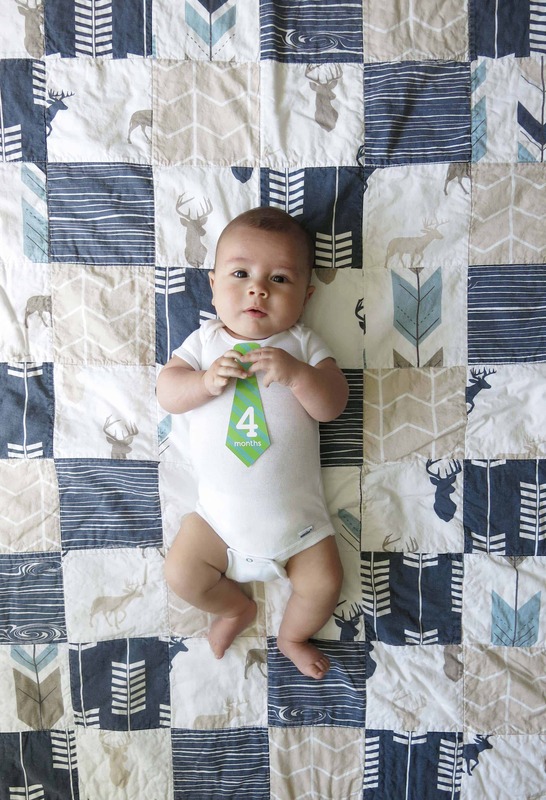 The arrow changing pad cover was custom-made from Little Oasis Nurseries on Etsy. She also made the bed skirt shown on the crib and this amazing quilt that we’ve been using for our monthly pics. She was a joy to work with on this custom bedding set, which I added to my Amazon baby registry, using Amazon’s Universal Registry button. You may have remembered in my my inspiration post that I mentioned I was going to make a mobile for our rustic boy nursery… well, I did. Almost. 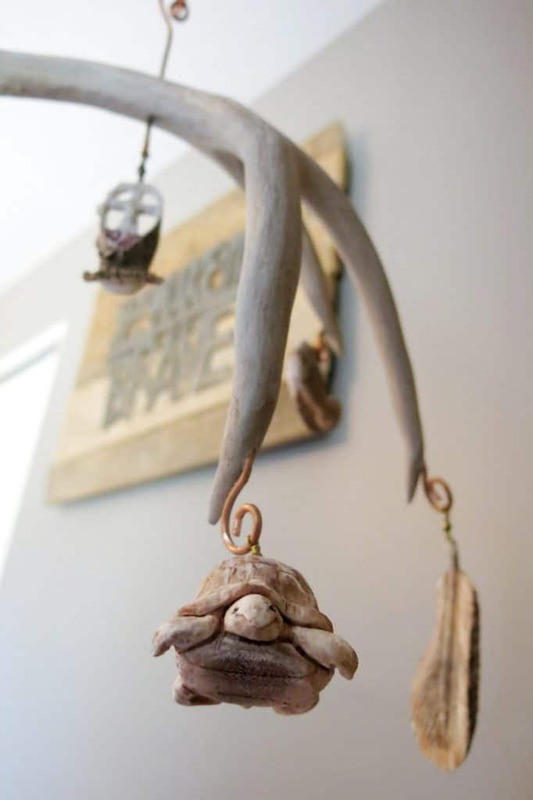 And then I received this antler mobile with hand carved little animals and other rustic-y items on it as a very special gift at my shower. I took one look at this thing and just about fell in love. My halfway finished DIY mobile project came to screeching halt. 🙂 The lady that made this for my Grandma was a family friend and doesn’t have an online store or anything. Here’s the closest thing I could find on Etsy. 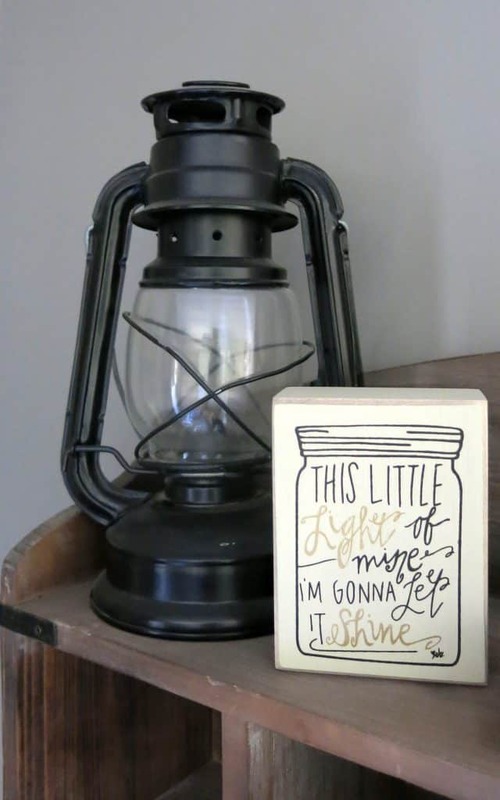 I loved the idea of putting a lantern in the woodland nursery to give it a rustic feel. When I found this little mason jar decoration at Hobby Lobby, I knew it was meant to be. 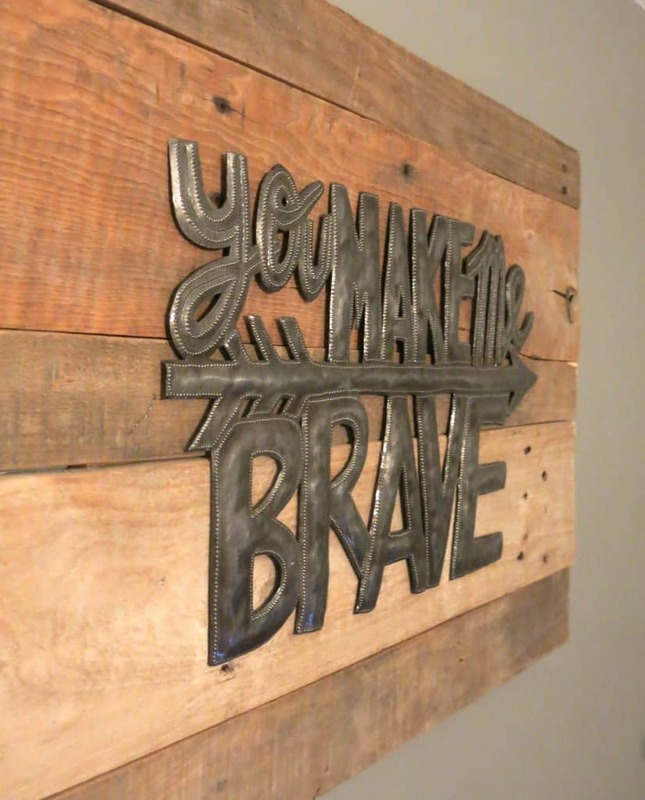 You may have seen my post about this on Instagram, but this “You Make Me Brave” piece above Cal’s crib is super special. Logan sister, Amanda, started a non-profit called Unified in Mission a couple years ago now and she is living part-time in Uganda, Africa doing mission work and spreading the love of Jesus there. While she was visiting another friend that works as a missionary in Haiti, she had a bunch of these rad metal signs handmade there. She is selling them on her Etsy store, UgandaLoveIt. All the of the proceeds go towards Unified in Mission. They are doing some awesome things in Uganda, like building a school, running a child sponsorship program, and installing water tanks. Since we have grey walls and I really wanted this metal sign to stand out, I mounted it on a pallet wood sign with command strips. Speaking of Africa, here are some fun pieces that Aunt Amanda brought back from her just for Cal! The block in the middle is a personalized wood block with Cal’s birth stats. This is a cherished gift that we received from a co-worker. 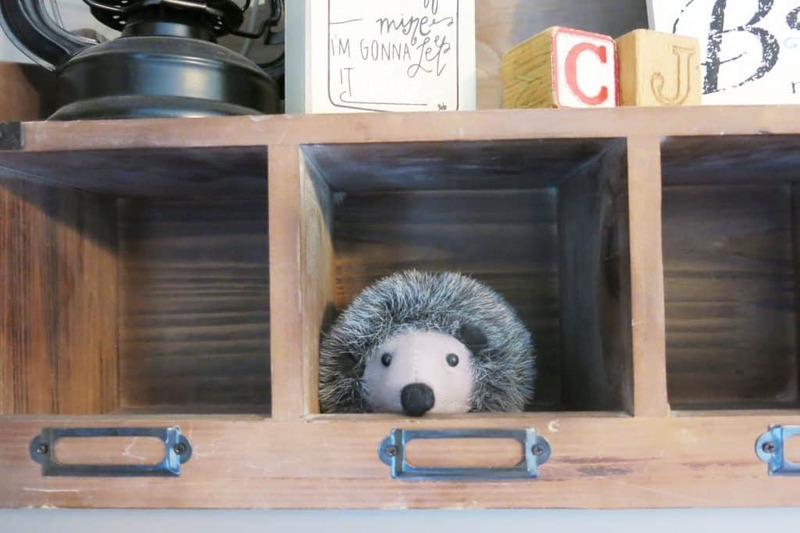 Storage is so important in a nursery, especially easily accessible, you-can-grab-it-with-one-hand type of storage. I got this 3-tier basket rack at Hobby Lobby. It was originally teal (the teal one is no longer sold) and I painted it white (Then a couple weeks later I found this one already white at Hobby Lobby... haha, I guess it was a DIY for the sake of DIY!) It is great for holding diapers, swaddle blankets and tons of burp cloths. I also found out it’s important to have a little floating diaper caddy to keep out in the room where you spend most of your time, probably your living room. 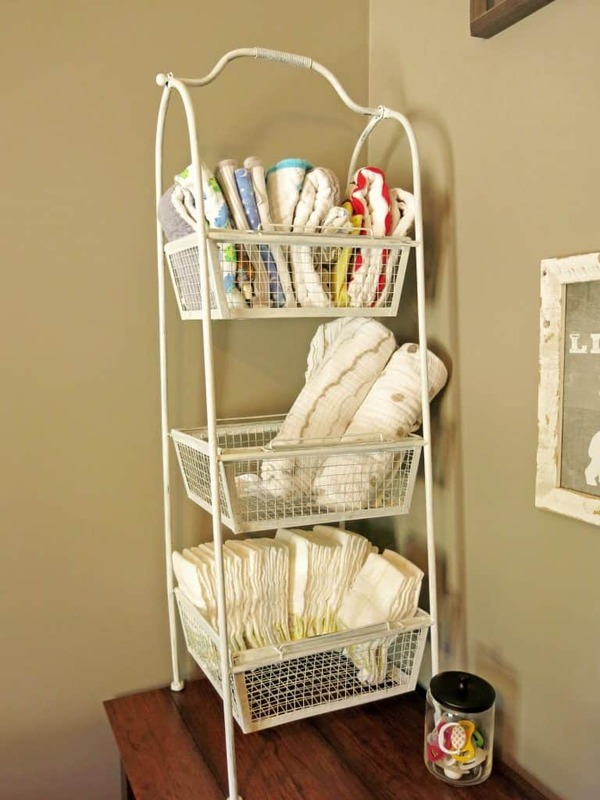 I love this DIY diaper caddy! The amount of diapers you go through in the beginning in INSANE! 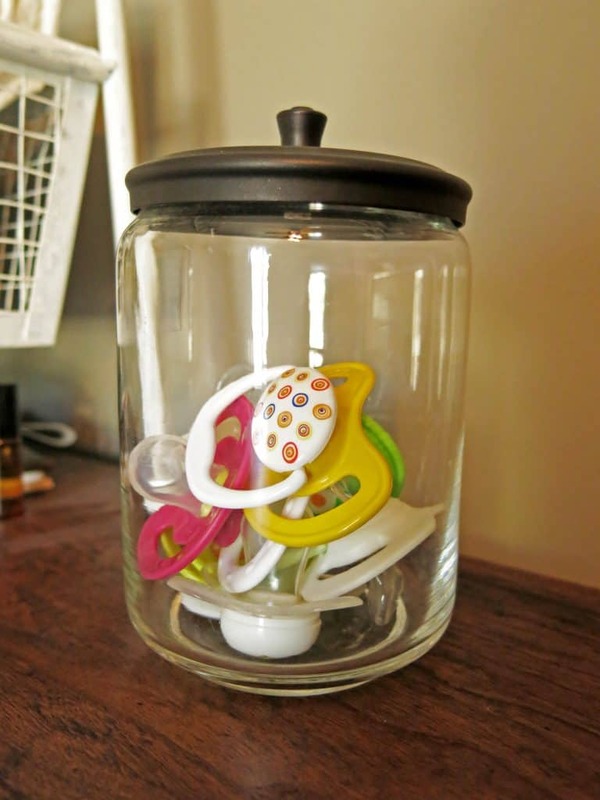 Speaking of nursery storage, I used this fun little glass jar with a lid to hold extra pacifiers on the dresser. With a little boy, you never know where the pee is going to end up, so this keeps the pacifiers nice and clean. Isn’t this poem just the sweetest? It’s such a great reminder to just stop and take in all the baby-ness. You can order this sign for your little one’s rustic nursery from my Etsy shop here! 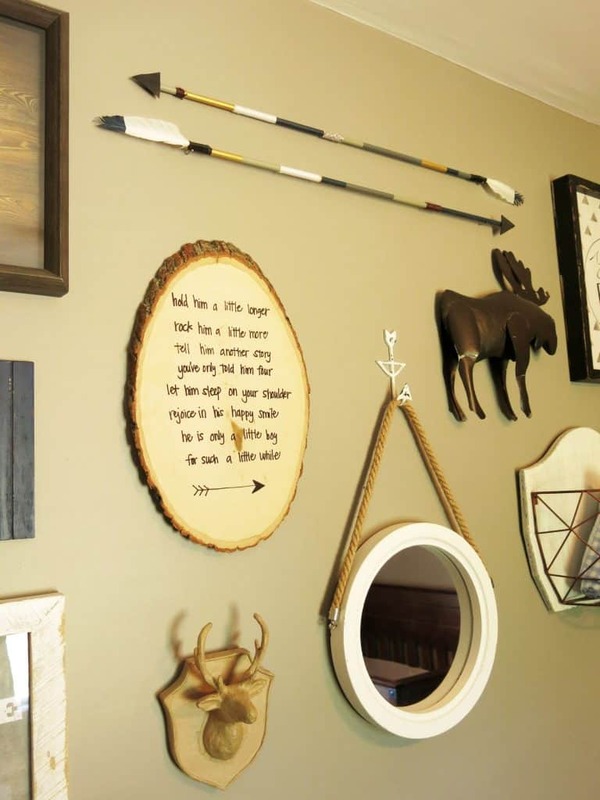 Those arrows were another fun DIY project I took on for this rustic nursery. You can check out the full tutorial here. 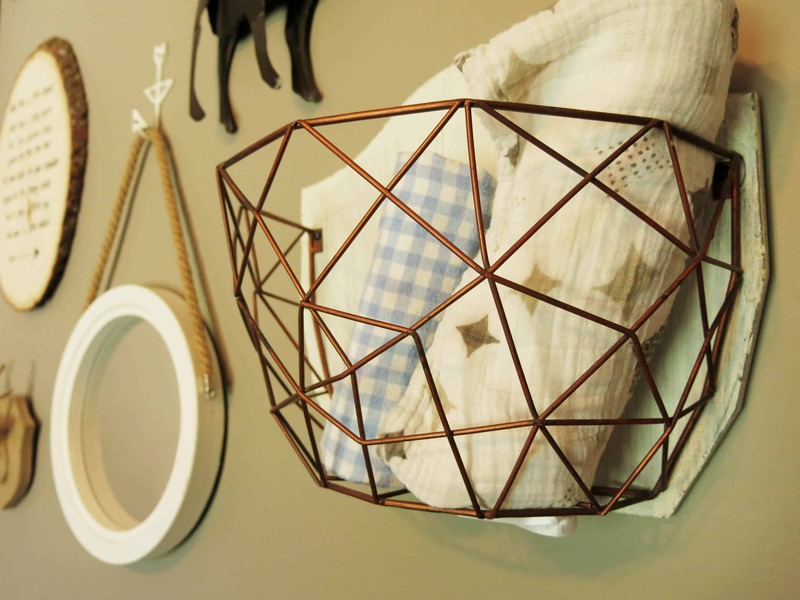 I love this little geometric wall basket, don’t you? I got this at Hobby Lobby way discounted because it was going out of stock last spring (so it’s no longer sold 🙁 ). It was originally a grey background that I painted white so it would stand out a little on our grey walls. I couldn’t find anything similar to this online anywhere (let me know if you do), but this pallet wall wine rack could be a totally cute solution if you’re wanting to add some wall storage to your gallery wall. I know, I know… the baby is way too young for wine, hehe. But it would serve the same purpose by providing a quick woodland nursery storage solution for some rolled up swaddle blankets. My gallery wall is one of my favorite parts of the rustic boy nursery, but it did not come together easily. It took me weeks to decide on the layout and the pieces. I had originally purchased a super awesome mirror from Michael’s that I loved but once I got it home and started trying to build the gallery wall around it, I determined that it was just the wrong color blue and it was too big for the small space in our rustic boy nursery. Further Reading : Need help putting together your gallery wall?? You’ve gotta read this post on how to plan your gallery wall layout! I returned it and got this white hanging mirror & white arrow hook (no longer sold, similar here) from Hobby Lobby. I am now convinced that I put it in the perfect spot on the wall too because Cal’s new favorite thing is standing on the changing pad and looking at himself in the mirror. It’s the perfect height for those giggles. I snagged this clock at a garage sale last year for $5. Score! 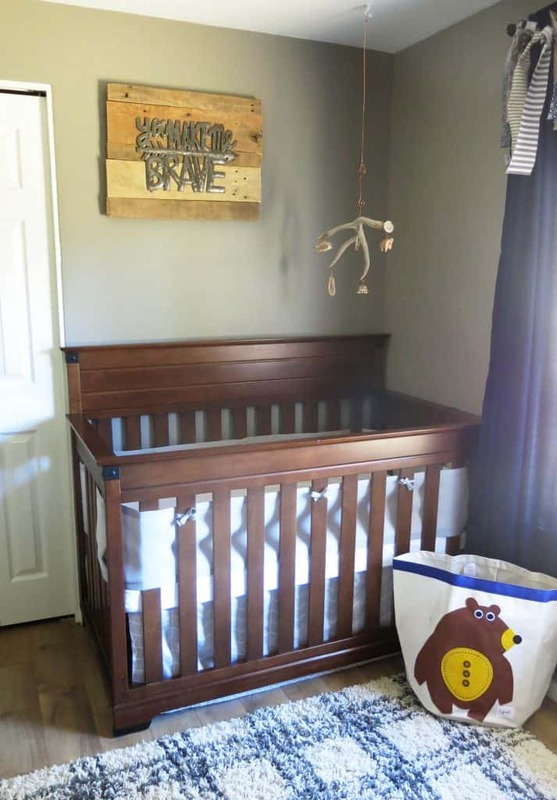 Love the way it looks in our guy’s rustic nursery! 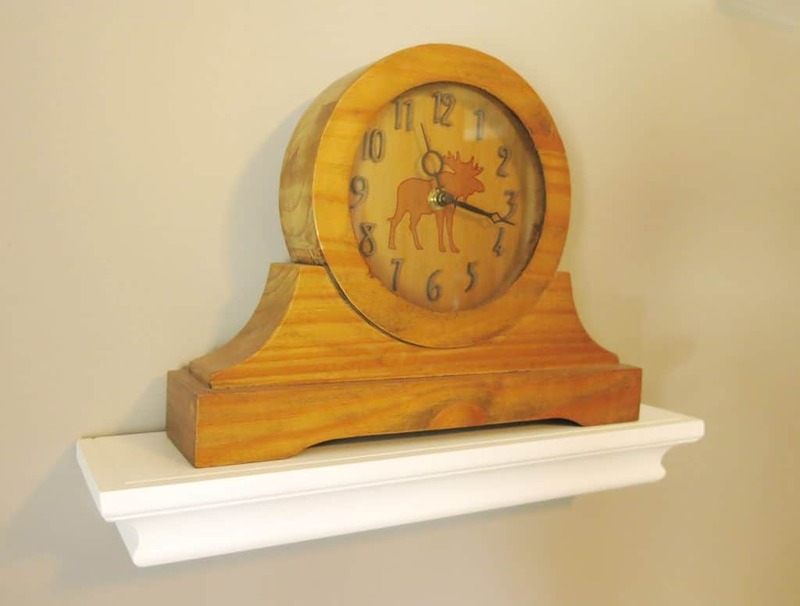 Here’s a pretty awesome Moose Clock on Etsy! Still on the to-do list is make a fun accent table out of these rad birch logs my hubby brought home one day. Until then, this fun little vintage wood stool is in its place. Side note – if you’re looking for some great bedtime stories, these are our favorites. 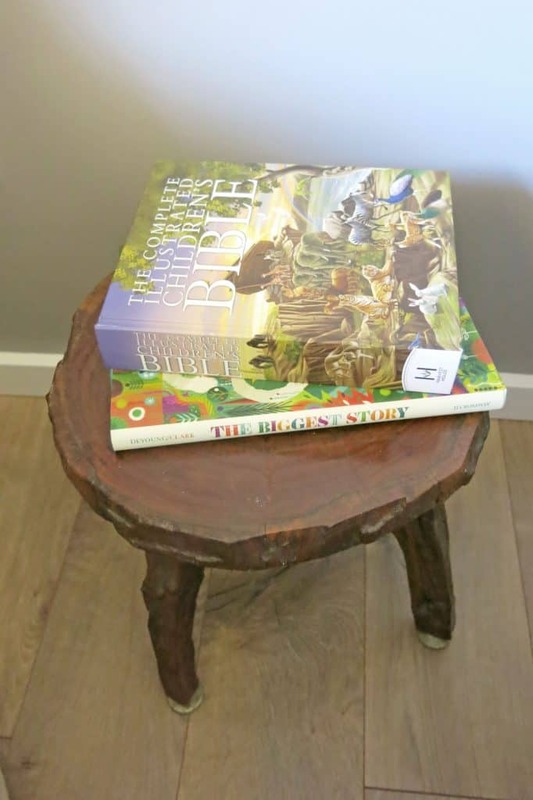 The Complete Illustrated Children’s Bible is the most biblically accurate ones out there and has great realistic illustrations. The Biggest Story is a fun take on the Bible in a story format with very colorful and playful illustrations. We love them both! I got this shelf from T.J. Maxx years ago! 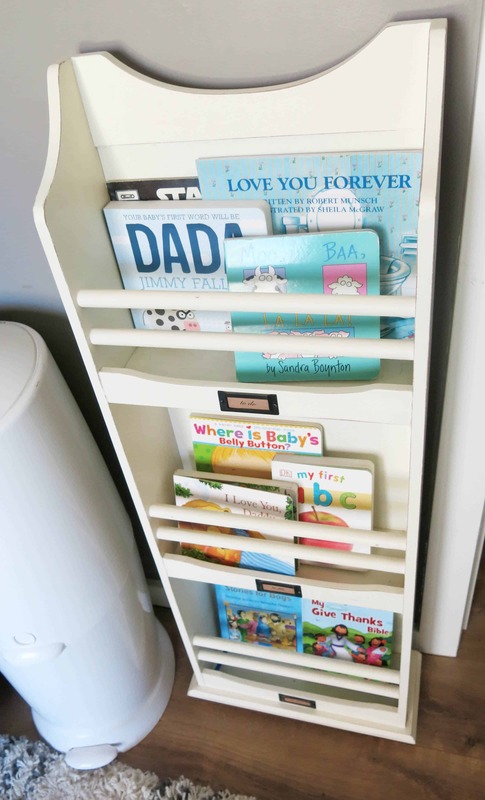 It works perfect to hold our growing little library of baby books in our rustic boy nursery. How perfect is this fabric banner?! I can’t take credit for this one. It actually is one of the decorations from baby shower. My amazing sister made it by taking cut and ripped fabric strips and ribbon tied to a piece of jute. Those simple navy curtains are from Target. Keep in mind that those curtains are not black out. I didn’t need black out curtains because our cellular shade blinds are blackout in his room, so they do the trick in our rustic nursery. These vintage chairs are seriously some of the most comfortable chairs I’ve ever sat in. We purchased them a couple of years ago at a thrift store in town. I think we paid $60 for the set. We actually got that deer pillow for our wedding years ago. It was from Pottery Barn, but they obviously don’t sell it anymore. 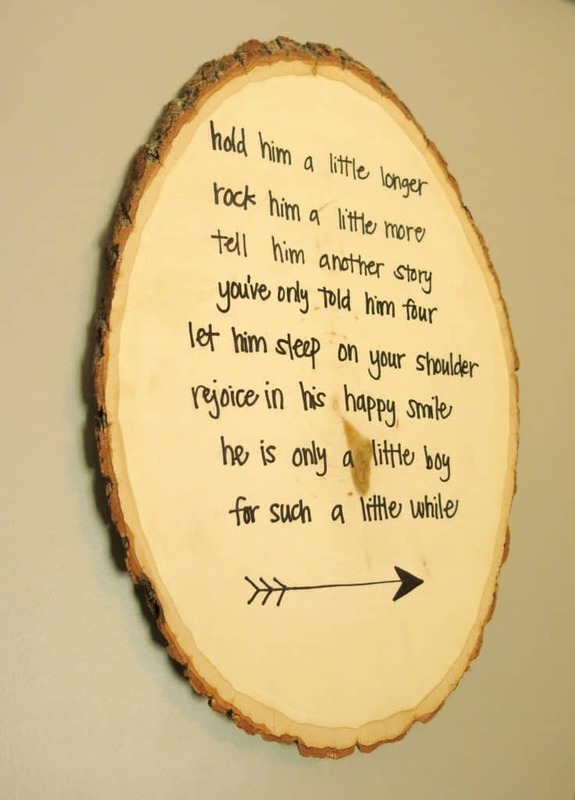 Here’s something similar you could use in a woodland nursery. I had fun with that “Our Little Boy” framed art and I made it myself. I downloaded a grey chalkboard vector background and bear vector clip art and threw that little thing together in no time! If you don’t have graphic design software, I’d recommend Canva. It’s free online and very easy to use. The white frame is from Michaels, but doesn’t look it is sold anymore. Here’s a couple other good rustic white frames – version 1 – version 2 – version 3. Oh hello there Mr. Hedgehog. I had the cutest little audience while I was snapping these woodland nursery photos. 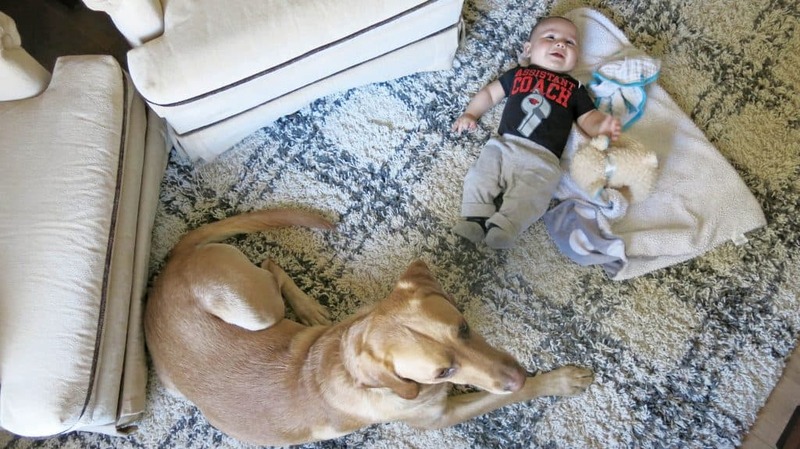 They are just chilling on our all time fave Samos Rug from Target. We replaced all of the light fixtures in the bedrooms and living room with these. Well, that’s a wrap. If Gannon had his way, we would all lay down and take a nice long nap on this rug here… doesn’t that sound nice?? Want to see more of our woodland nursery?? Our rustic nursery is now, of course, my favorite room in the house. I love cuddling with Cal and reading him his bedtime stories in that comfy chair. 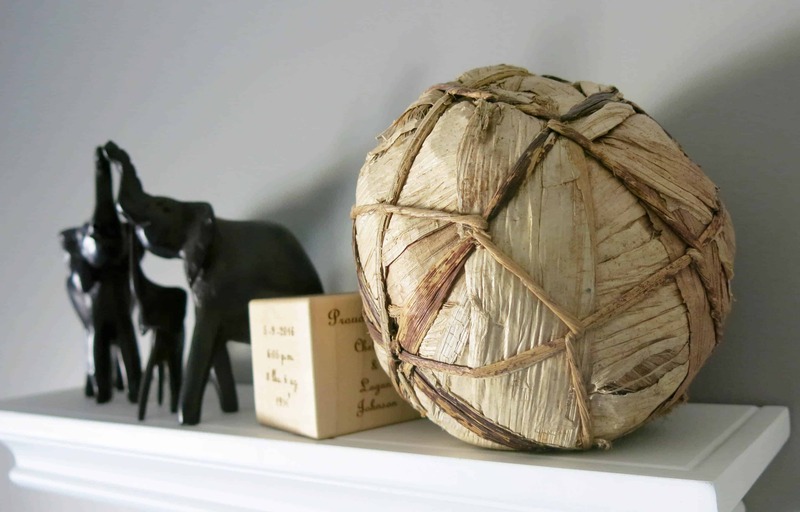 What was your favorite thing about our boy’s rustic nursery? 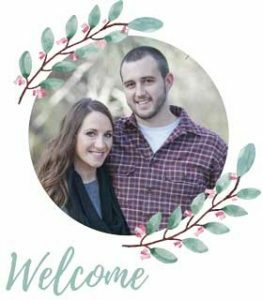 « The Ultimate Wedding Registry Checklist + Free Printable! A friend of mine also did this for her nursery! 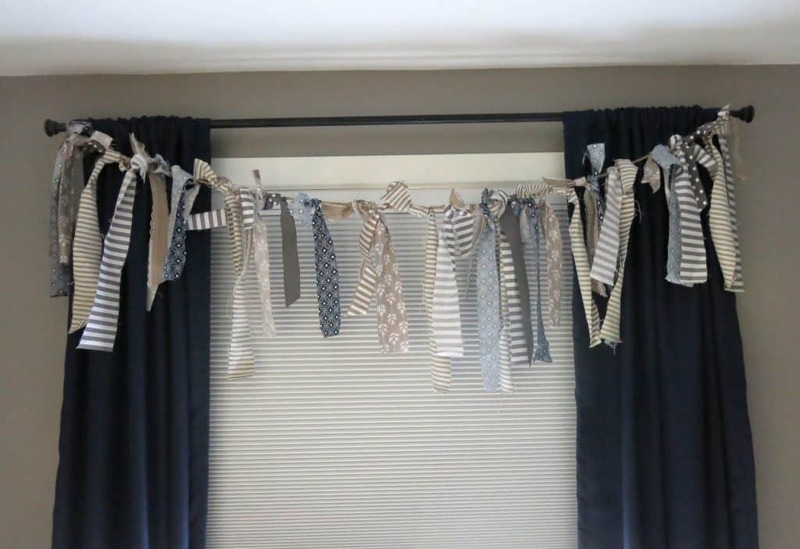 Such a cute nursery theme, and so much you can do with it. Thanks MaKenna! I just love the theme and even though mine is mostly blue it can be gender neutral too! Thanks for stopping by! Currently working on my little mans nursery and love the rug you used. I’m wondering what the exact colors are? Of course it doesn’t say the colors on Target.com. Is it cream and dark grey? Thanks in advanced. Yep it’s a cream and grey color. I love the combination and it’s super fluffy. Perfect for tummy time! Good luck with your little guy’s room and congrats!! I never got an email saying you responded back so I just came back to look and am so glad I did!! Thank you so much for getting back to me!! What color/brand paint did you use? Hi there, I also had a bedding set made by someone on Etsy but would like to include it on my registry somehow…how did you manage to do this through Amazon? Hi there! Amazon has a Universal Registry function that allows you to add items from any website to your Amazon Registry. Full instructions can be found here (affiliate link): http://amzn.to/2qymtZX Congrats & best of luck to you Jonnelle! I’ve actually gotten a few questions about them (I think because of the bad reviews online). I’ve had no issue with the dresser and love how it matches. I, of course, can’t speak to how the dresser will hold up over the years. But we’ve had it 1 and 1/2 years now and no complaints here. It gets light use….I just grab clothes out of it once a day, our little one is certainly not climbing up the drawers or anything quite yet, hehe. Iam curious about the texture of the rug. I just got mine in and the shag looks more like yarn. I have another shag rug in my house and its very soft looks like it does in the manufactors pictures. But the rug I got in does not look like the texture in the pictures. Like i said it looks more like plastic yarn. How did yours look when you brought it home and how did it fluff out and sofen over time? My photos shown on the blog post are taken within about 2 months of having the rug so that is a good indication of how it looked when I brought it home. Now that we have had this rug over 2 years, it has held up great. When it doesn’t get vacuumed for a while, it does tend to look flat. But it perks right back and looks like new after I clean. 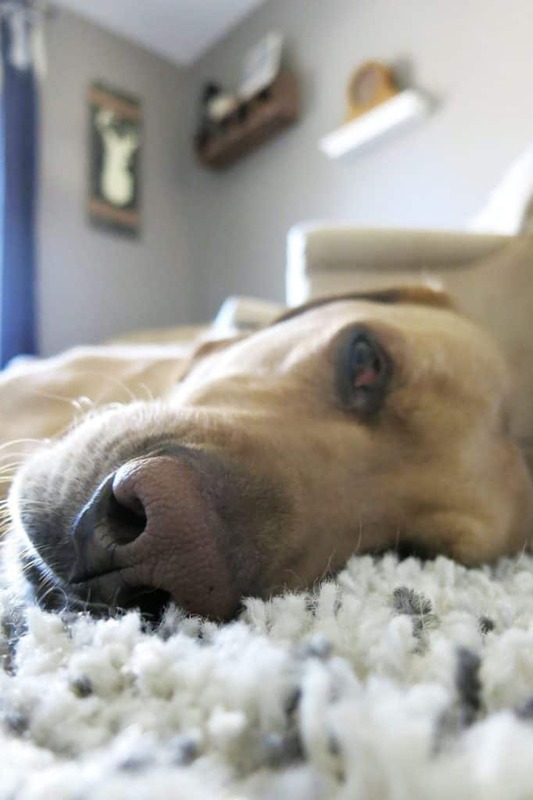 The shag on this rug is very similar to a durable yarn. Hope that helps!